Scarlatti’s Sonata K27 is a work I have painted at least twenty times, by dividing it up into four parts, each with multiple iterations. The variations in performances of this sonata are very diverse and its meaning is richly developed. I am not sure what it is about this sonata that has made it so compelling to so many musicians, with the exception that it bears whatever you bring to it and gives it back in a different form. 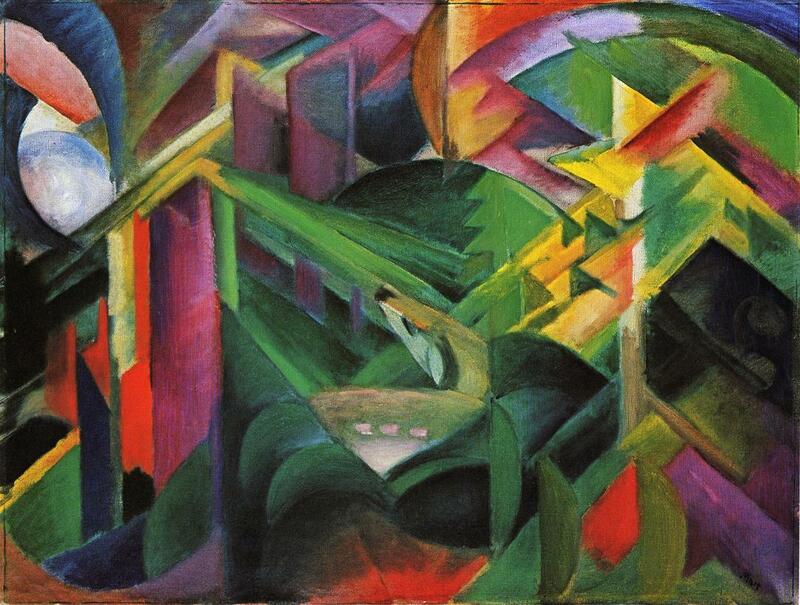 This iteration takes on the colors of Franz Marc’s Deer in a Monastery Garden. I first encountered Franz Marc’s work in person at the Art Institute of Chicago. I sought out a publication of his Letters from the War, which chronicled the changes in his views of art and life as he served. His painting Deer in a Monastery Garden is profound to me, full of shimmering light, but still taking on qualities of the time period it was created in. Franz Marc died in WW1, seeming to have barely held on to his identity and sense of purpose, but maintaining the deep affection he had for animals such as deer and their innocence as creatures. My painting is intended to show the light coming over remote hilltops, down through the branches and into the forest, striking the resting fawn. It depicts part two of the sonata.